I'm going on vacation Thursday (hence the amped up posting routine). This is most likely what will still be on my nails when I leave. I really liked the way it turned out. 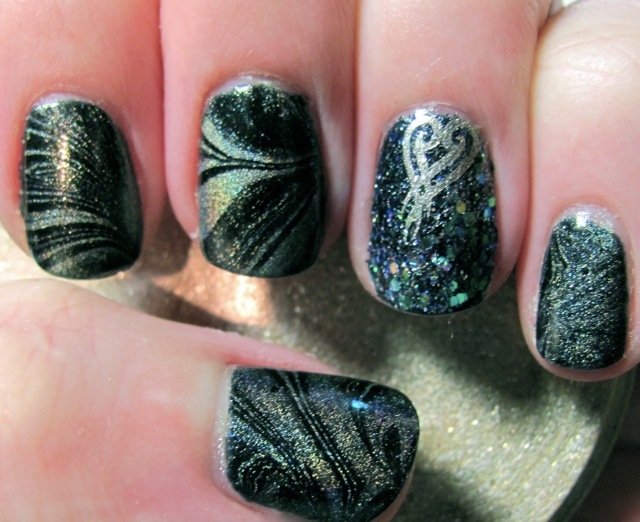 I've named it such because I kept adding polishing mediums for the look: marbling, glitter and Bundle Monster. I hope the pictures capture it's awesome holographic edge. I love marbling with my old school China Glaze OMG polishes. I painted three coats of Zoya Edyta. On my ring fingers I added LA Splash Cosmetics Nail Glitter in Onyx. 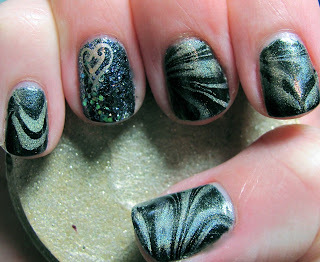 My marble was done with China Glaze L8R G8R and Sally Hanson Diamond Strength in Flawless. The stamp used Bundle Monster image disc BM212 and China Glaze Passion. Seche Vite was my topcoat.